Evaluating the Impact of Meteorological Factors on Water Demand in the Las Vegas Valley Using Time-Series Analysis: 1990–2014. Patcha visited the Data & GIS Collab for assistance getting the last piece needed for this article. Together with the GIS support Students, Jenny Latessa (DAAP) and Shiyu Gong (Geography), they created a map of the study area. We are happy to see the final published version is now available. Congratulations and we hope you visit the Data & GIS Collab again. UC Libraries and The Graduate School are pleased to host the Center for Open Science for a workshop on Increasing Openness and Reproducibility in Quantitative Research on October 25, 2017. The workshop will cover project documentation, version control, pre-analysis plans and the Open Science Framework. There will be two sessions of the workshop, one on East campus and one on the West campus. The event is free and open to all. To register, visit https://goo.gl/Hf5neh. Participants are asked to bring their own device for best workshop experience. Questions? Please email Amy Koshoffer at ASKDATA@UC.EDU for more information. Posted on Behalf of Jane Combs – combsje@uc.edu. The Ohio Supercomputer Center will offer two workshops on its resources and how to use them Tuesday, October 10, on both East and West campuses. IT@UC Research & Development will be hosting the Ohio Supercomputer Center for two workshops on Tuesday, October 10. The morning workshop will provide an introduction to the Ohio Supercomputer Center resources and how to use them. In the afternoon, the workshop will cover Big Data Analytics and Spark. The Ohio Supercomputer Center, headquartered in Columbus, partners with Ohio researchers to develop proposals to funding organizations and is the state’s leading strategic research group. GIS stands for Geographic Information Systems. GIS has applications for both teaching and research across many disciplines. Do you need to visualize your spatial data but don’t know how? Do you have spatial data but don’t know how to map it? Are you looking for guidance or have expertise to share regarding the analysis of spatial data? Are you an ArcGIS, Q-GIS or other GIS program user and want to connect with other people who use these programs? Are you simply curious about GIS and want to learn more? The GIS Learning Community can help you address these and other questions. The goal of the community is to be a user-driven forum for novice and expert practitioners to come together and discuss tools, resources, projects and solutions surrounding the spatial aspects of their data. We invite interested individuals across all of UC to join us in building this community. The community is open to All Faculty, Staff and Students, as well as interested parties from outside of UC. Please share with your colleagues and students. RSVP and Join the GIS LC at https://form.jotform.us/72324913145149. If you are interested in the GIS Learning Community and are not able to come to the first meeting, RSVP or email ASKGIS@UC.Edu to be added to the GIS LC email list. Future invites will go to the GIS LC email list only. There will be no consult hours from Monday July 10th through Monday July 17th. On July 18th the normal schedule will resume. During these times, both workstations will be available for self directed public use. What is an ORCID? ORCID stands for Open Researcher and Contributor ID. You can now access your ORCID account using your UC login. Visit the ORCID login page and click the Institutional Account button. Choose University of Cincinnati Main Campus. You will be prompted to link the two accounts. Don’t have an ORCID yet? You can access a prefilled registration form linked to your UC email through Scholar@UC on your profile page. Contact ASKDATA@UC.EDU for more information or with questions. If you missed the June 1st webinar about the Open Science Framework, the recording is now available. Do you have any additional questions or need help getting started? Just email AskData@uc.edu. The Researcher Services group, an initiative of UC Libraries with the IT@UC R&D Team, is pleased to announce a new tool for research projects: OSF for UC. There is no cost to use OSF for UC. 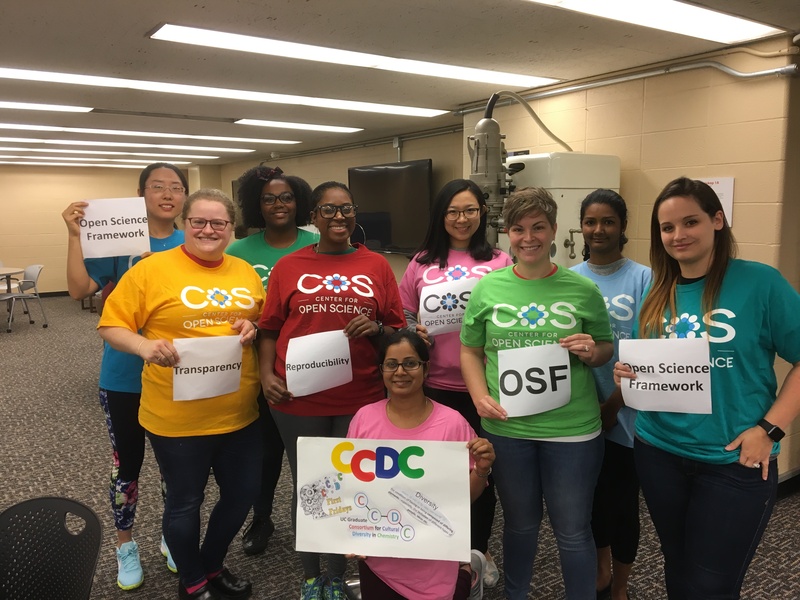 OSF, or the Open Science Framework, an open-source workflow tool appropriate for any discipline and developed by the Center for Open Science. OSF for UC — osf.uc.edu — is UC’s portal for students, faculty, staff and others who need to manage project files and documents. Sign-in is easy – go to osf.uc.edu, sign in, choose University of Cincinnati, then your UC 6+2 Central Login. Through OSF, project teams can assign collaborators (internal and external to UC) and share project documents at a granular level (only share what you want, with whom you want). Projects managed through the OSF are private by default. Any or all parts of a project can be made public as desired or required by grant funders or others. The major focus of UC Data Day is to build community around best practices for data and to provide a forum for discussion about challenges and opportunities in data management, data sharing, reproducible research and preservation. At the first UC Data Day held in 2016, faculty panelists began the conversation and highlighted the diverse and broad approaches to these challenges. For the second UC Data Day, we wanted to include a student voice as well.